Proform Universal Piston Ring Compressor Adjustable from 2.500" to 5.000"
Proform 67655 - Universal Piston Ring Compressor Adjustable from 2.500" to 5.000"
The JEGS Ring Compressor is absolutely the quickest and easiest way to install pistons. Simply slide the ring compressor clamp over the rings, give it a squeeze and tap the piston into the block! Compressor Set includes ratcheting pliers and six compression bands that range in size from 2-7/8'' up to 4-3/8''. That should be plenty big enough for us mortals who are not building behemoth mountain motors that have a bore size larger than 4-3/8''. 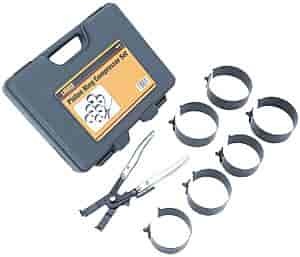 Pliers and ring compressor bands come in a sturdy plastic storage case to properly store and protect your investment. 80516 is rated 4.5 out of 5 by 2. Rated 4 out of 5 by Howlinhairy from Works! Worked well on the harley davidson I am working on.